The streets of Avignon are dead on this wintry night with the exception of a few Chinese tourists. How did they get here? Where is everyone else? We arrive late at Christian Etienne, but when we open the door, we are greeted with all the human warmth and sunshiny southern French accents were had been looking for on this southern escapade. We’ve seen the chef Christian Etienne in his kitchen on our favorite gastronomic French TV program twice in the last 3 months, where he appears to be a sensual, unpretentious man. The eponymous restaurant is considered one of the very best restaurants in Avignon and we’ve been meaning to come for a while now. The Duc came several times about 15 years ago and thought it was the best place in the Rhone valley at the time. We start by ordering some wine. A glass of Châteauneuf du Pape Blanc. We give him free reign. This is actually a test for the sommelier to see what his tastes preferences are, see if we can trust him to lead us to pleasure later on. 2008 Domaine La Janasse white, very famous for his red wines, and our first taste of his white. It is horrible. Over-filtered. Over sulfured. Could be any industrial white wine from anywhere. While we are thinking about our white wine menu, we decide to buy a bottle of a sure bet pleasure white wine: Alary Haut Coustias 2007 Clos St Oratoire. Our mouths are soothed and our minds swim in happiness. White flowers. Apricot and peach pits with almond dust. 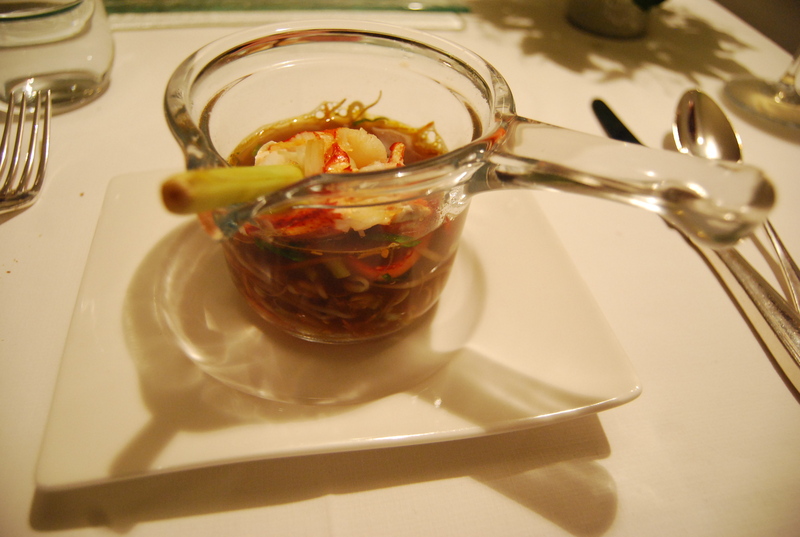 We start with Consommé de homard aux germes de soja, pinces à la citronnelle lobster and soy sprouts with citronella. The taste of the consommé is exotic and airy with the citronella, but bitter because of the soy sprouts. The lobster can’t seem to figure out what it is doing there. It likes the citronella (but is sort of dominated by it) and the bean sprouts are a little too bitter to let the lobster sing its true song. But it is very light, digestable and creative recipe. Accras d’articulations au fenouil, coulis d’olives cassées de la vallée des Baux Accras (fried fish dumplings) with fennel and olive coulis. I love the description of this on the menu-it seemed like one of the most exciting parts of the lobster menu-, but the reality is disappointing through lack of harmony. The fennel salad, on its own, is delicious, fresh and lively. The olive coulis on its own is also fantastic. The accras, made with tiny lobster legs is too spicy, you can’t actually taste that it has lobster in it. If you take all of the ingredients together, the dish is disjointed. I don’t understand why some chefs insist on using noble, expensive ingredients only to drown the base flavor with too many distracting and intrusive other ingredients. The Duc has the same problem with his scallops. Noix de Saint-Jacques rôties, royale de betterave aux pistaches salées et sa julienne à la ciboulette. The idea sounds good. We anticipate a play between the sweetness of scallops and beets. (I think I’ve mentioned before my admiration for chefs who use beets. After this tasting, I’ll add a caveat: I have a penchant for chefs who use beets and keep it simple!) The scallops themselves are perfectly cooked. Seared on the outside, warm, but almost raw on the inside. The royale de betrave is fantastic, if a bit heavily laden with cream. The pistachios with the beet is very original, bringing in textural crunch, and interesting bitterness. But this has nothing to do with the scallop. Same goes for the beet salad with the chive. Super on its own. I’d like a small bowl of that to finish my meal. 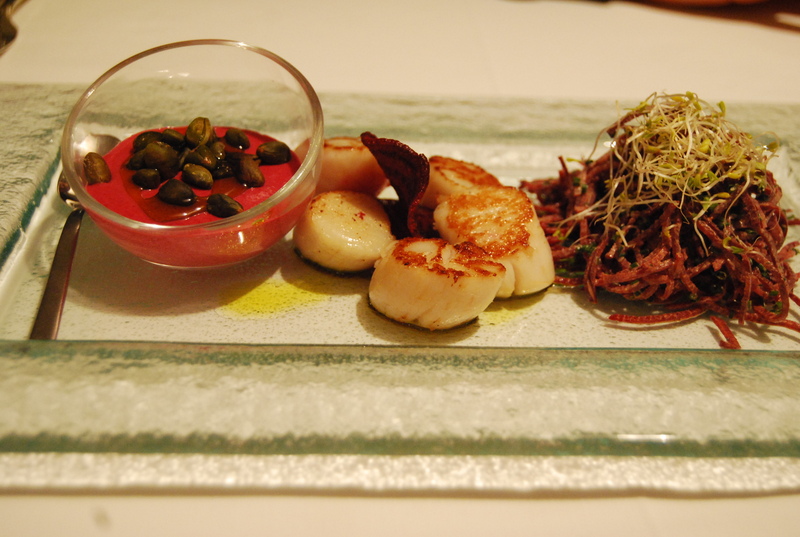 But if you take a bite with the scallop either of the beet accompaniments, you cant taste the scallop. What’s the point? Provencal cooking has a tradition of marrying different bitternesses together, but scallops and lobster are sweet by themselves and can only deal with suggestions of bitterness. I don’t actually enjoy reporting about less than great restaurant experiences. This one isn’t terrible; it’s just pretty disappointing. So much potential with quality of ingredients and cooking times, but the realization of the recipes lacks harmony…I will skip the descriptions of the other dishes we tried, so that I may finish on a positive note: desert. I’m not a big desert person, but did not refuse the opportunity when I was offered the choice of desert with the lobster menu. Seeing as it is truffle season, I chose the Tarte fine aux pommes et truffes. I’ve had deserts with truffles before. But nothing like this. This is truly extraordinary. And simple. Your basic thin crust and thin apple slices, not too grilled or caramelized so that it stays sort of blond. Rich creamy vanilla ice cream scoop progressively melting over the pie and truffles shaved over the top. Fantastic. 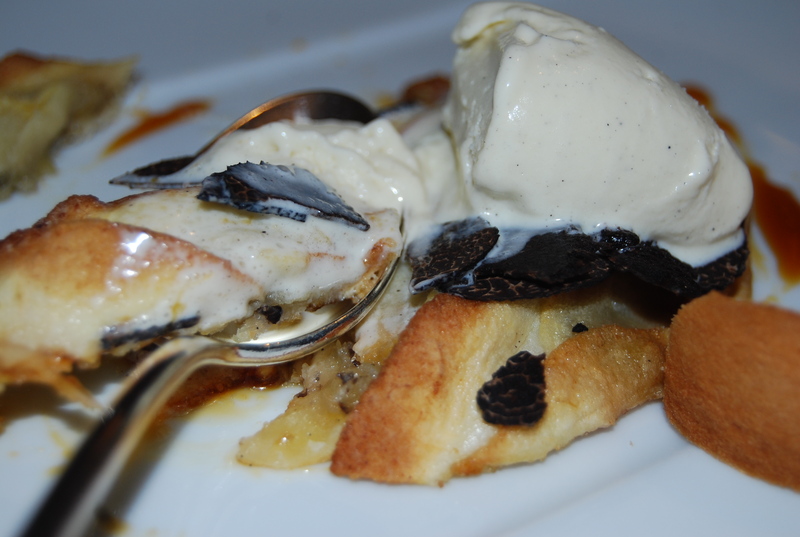 The apple pie is not too sweet; the vanilla ice cream brings the fattiness that a truffle needs to express itself. The sweetness of truffle comes out in tune with the vanilla. Neither over powers the other, perfect harmony. I’d go back to see Christian Etienne just for that dish! Next Post Did I mention the 2009 beaujolais?